C.E.T. 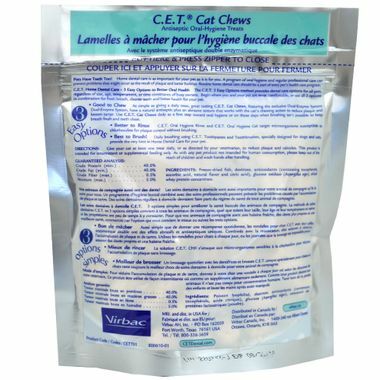 Chews for Cats are soft, chewy treats to which dual enzymes have been added that helps stop plaque from forming. PLUS the natural abrasion of these treats help clean your cat's teeth. Fish Flavor. Made from freeze-dried, farm-raised catfish, then specially flavored and treated with the CET dual-enzyme oral health care system. As simple as giving a daily treat, great tasting C.E.T. 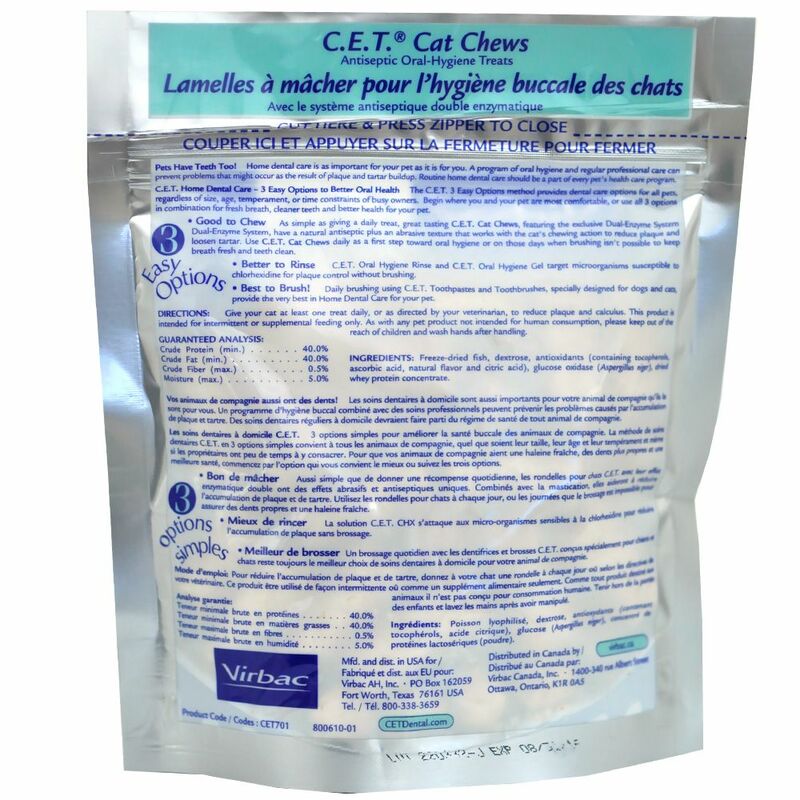 Cat Chews feature the exclusive Dual-Enzyme system to remove plaque and prevent the buildup of harmful bacteria. The plaque-fighting enzyme combined with the natural abrasive cleaning action of C.E.T. Chews help to keep breath fresh and teeth clean. Use C.E.T. Chews daily as a first step toward oral hygiene or on those days when brushing isn't possible. This tasty treat is clinically proven to improve your cat’s dental health. Exclusive dual-enzyme system naturally removes bacteria and freshens breath. The abrasive texture helps reduce plaque and loosen tartar with every bite. Enticing fish flavored treat can be fed daily to help clean teeth and freshen breath between brushings. 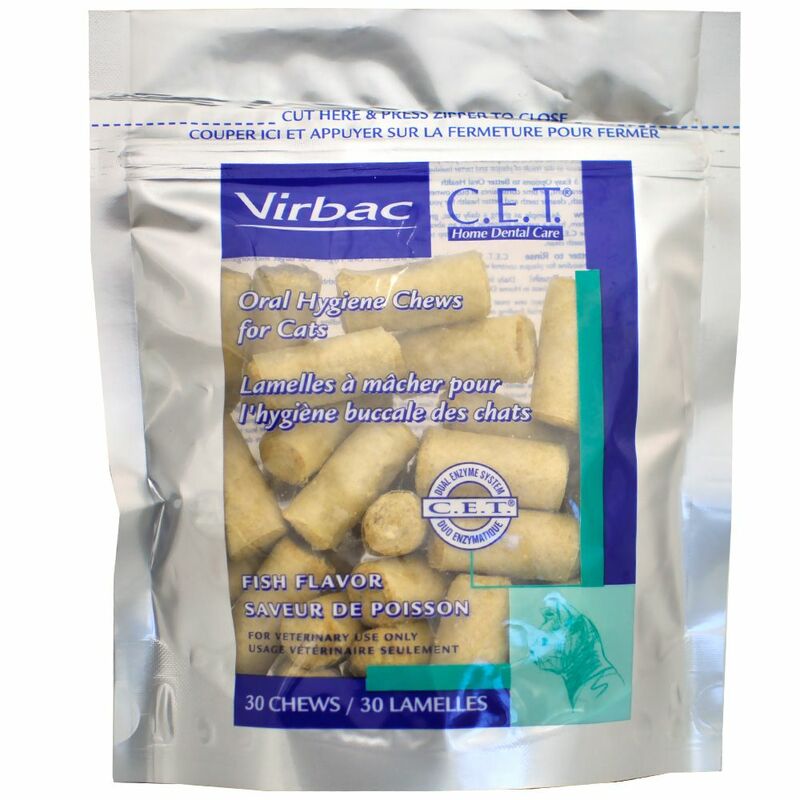 Each chew measures 1.38 x 0.63 inches; convenient resealable bag keeps treats fresh. INGREDIENTS: Freeze Dried Fish, Dextrose, Antioxidants (Containing Tocopherols, Ascorbic Acid, Natural Flavor and Citric Acid), Glucose Oxidase, Dried Whey Protein Concentrate. Give your cat at least 1 treat daily or as directed by your veterinarian to reduce plaque and calculus. This product is intended for intermittent or supplemental feeding only. Good product that my cat likes to eat. It stays fresh long and my cat looks for it as a treat. My cat LOVES these CETchews! I got these treats to help keep my cat's teeth in good condition. Unfortunately none of my 4 cats will eat them so I'm unsure if they do what it is they are supposed to do. I'm hoping they'll eventually give in and eat them. Until that time, I cannot give these more than the 2 stars. They arrived quickly on the up side. My very shy kitty becomes assertive when it comes to these treats. She loves them and begs for them. I give them each one a day. ProsThe kitties not only enjoy them, I feel they are doing some good for their dental health. ConsVery, very pricey. Feels like a great splurge but worth it. My cat, Cati loves them. She chases them, attacks them, carries them around the house, and when she thinks she's killed it, she eats it. I have not been able to find an available and Cati sits in front of the cupboard where I keep them and cries and begs. This is the best treat, friend, and dental care for my cat. I cannot find them anywhere.